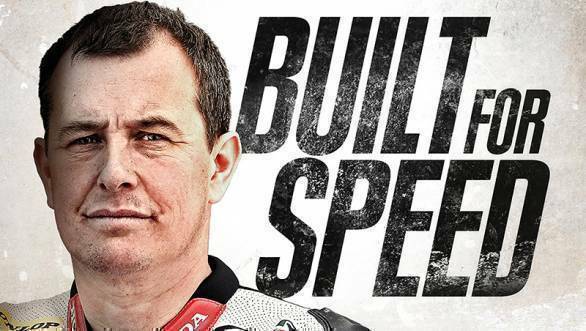 You can't understand the sheer magnitude of John McGuinness' achievements at the Isle of Man TT, unless you know where he came from, how he grew up, and just how hard he worked to get to where he is. And it's fairly evident that McGuinness would like you to know exactly how hard he's worked for his success. 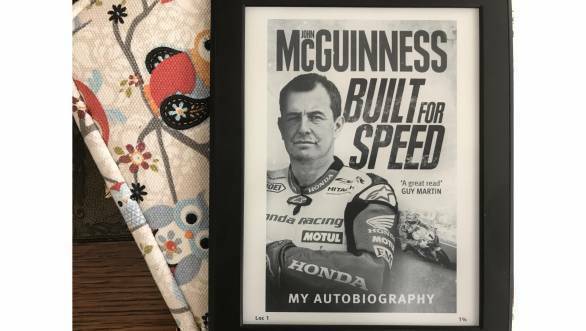 His recently published autobiography Built For Speed, emphasises McGuinness' humble beginnings, and details exactly how he went from being a "Brickie from Morecambe" to being the legendary rider at the Isle of Man TT that he is. The book starts with the early years. McGuinness is chipper about his life at home with his parents. But he does admit that there were hard times. His father's desire that his son excel in the field of racing, and his inability to articulate exactly what his son was doing wrong on a motorcycle that led to temper tantrums and altercations between the two. And McGuinness' fondness for his grandmother, whose death shaped the way he views the Grim Reaper and subsequently how he dealt with the fact that he lost so many friends at the dreaded mountain course. McGuinness paints an accurate picture of a childhood at Morecambe, including the many early motorcycles he rode, his relationship with his then girlfriend, and now wife, Becky, and how he did in school. To be honest, it makes for entertaining reading, simply because a lot of the book has been put down exactly the way McGuinness speaks. But perhaps it's the early years of racing that really stand out. And it helps the reader understand so much about what makes McGuinness the person that he is. The book is full of tales of near misses, just about managing to scrounge together money to go racing, and the loyalty of friends and family that helped him go motorcycle racing. Perhaps the most touching part of the book is when McGuinness, unabashedly talks of his hero, Joey Dunlop, and the relationship they shared when they got to race together. But we won't give you details about that, except to tell you that you ought to read the book and enjoy both sides of McGuinness' - the TT fan and the 23-time TT winner. What also makes the book rather special is that McGuinness doesn't shy away from telling the whole truth. Oh there are parts of the book where he comes across as slightly bumbling, which is rather endearing. But there are other parts where he speaks of things that he perhaps didn't do right, things that maybe he regrets today. They don't paint a particularly pretty picture, but they do a pretty good job of explaining just how human he is. As the book progresses, there are instances described that make you understand just how much McGuinness wanted his success at the TT. Other instances allow us to get inside McGuinness' head, as he's barreling down Bray Hill at the Isle of Man TT. Still others talk us through the psyche of the road racer, how McGuinness feels about the way people view him and his skill, what he hopes to accomplish and what he believes he's achieved in his life. There are very pertinent life lessons, too, that come out in McGuinness language, which makes them all the more impactful. Read the book if you want to know everything there is to know about John McGuinness. I don't think you'll need to read another magazine article or watch another video interview of the Morecambe Missile when you're done with it. It's a tell all - the good, the bad, the ugly. You'll know the whole John McGuinness when you're done. At least as much as he's willing to let the world see.